Indeed, Christianity, unlike the pagan way of life – be it in deep antiquity or at the present time – requires work on oneself, the struggle with one’s passions, the constant training of the spirit and will, and ascending above. 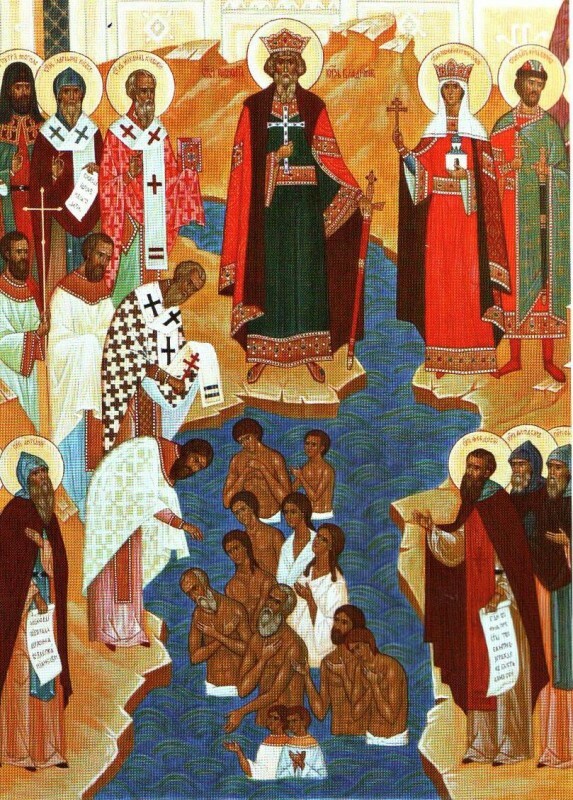 I cordially great you all on this great feast day: the Day of the Baptism of Russia and the feast day of our Baptizer: the Holy, Right-Believing, and Equal to-the-Apostles Grand Prince Vladimir. At this majestic monument, with a marvelous view of the Dnieper, one cannot but help but imagine the great feat that the Right-Believing and Equal-to-the-Apostles accomplished here. The Baptism of Russia was preceded by years of cautious study of all the religious choices that were then available. From all this variety, Prince Vladimir made the fateful choice of accepting the Orthodox Faith. And inasmuch as the Prince’s Baptism was not just a private matter – after all, the head of the nation was being Baptized – his choice became that of the entire nation. We cannot even imagine how difficult this step would have been for the Holy Prince Vladimir. Each of us knows from personal experience how difficult it is to resist entrenched traditions and customs, even if they are bad customs. They get into people’s flesh and blood; they create a kind of external culture, breaking with which is an act of courage, an act that is undoubtedly viewed negatively by others. So it was in the time of Prince Vladimir. For many, the paternal pagan faith was near and dear. It indulged human passions; it liberated human instincts; it was accompanied by both stormy feasts and bloody sacrifices. This faith formed not only the national character of the people, but also a kind of visible culture; however, the great Right-Believing and Equal-to-the-Apostles Prince took a decisive step in the opposite direction. There were certainly people then who said that he was making the wrong choice of all the available options. And we know for sure that many of his people did not approve of his choice, because their soul remained pagan. It was hard for them to break with the freedom of pagan customs and to accept new commitments before God that demanded spiritual struggle and self-sacrifice: that is, that which was opposed to the pagan way of life. 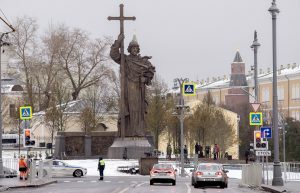 But despite these difficulties, an historical act was accomplished: with the Baptism of Russia, it made its choice of civilizations and for the duration of centuries would maintain fidelity to this choice. In our difficult times we are faced with the same temptations Prince Vladimir faced. One person talks about the Great Prince’s mistake, that he looked to the wrong geographical side; that he should have made a different choice and then, they say, our life would be better. The ancient Kievans probably said the same thing: why is he making this choice? Why is he imposing new burdens on us? Why is he requiring of us that which the old faith did not require? For many people today, as for the ancient pagans, the Orthodox Faith is a grievous burden. To some it seems as though it binds their personal freedom, that it makes impossible demands, that it interferes with life’s pleasures and the voice of the flesh. Indeed, Christianity, unlike the pagan way of life – be it in deep antiquity or at the present time – requires work on oneself, the struggle with one’s passions, the constant training of the spirit and will, and ascending above. And going up, as we know, is much more difficult than going down. This requirement that each person and each nation become better and better, becoming spiritually and morally strengthened, is perceived by many people today as grievous burdens, resulting in murmuring like the pagan Kievans. 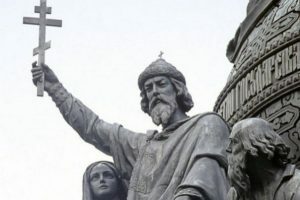 But Prince Vladimir conquered, defining the civilized growth of his nation, including through the Mystery of Baptism of his people, in terms of the great tradition of the spiritual and moral life, which was crowned and adorned by the feats of a host of saints and New Martyrs. Today we believe that, despite the pagan temptations of this world, by continuing the work of the Equal-to-the-Apostles Grand Prince Vladimir, we are moving forward, we are striving upwards, because whoever is not soaring towards heaven is doomed to groveling on the ground. I would like to wish from all my heart that the Ukrainian state, the Ukrainian people, and all of historic Holy Rus’ would preserve fidelity to the choice that was accomplished by the Equal-to-the-Apostles and Right-Believing Grand Prince Vladimir. 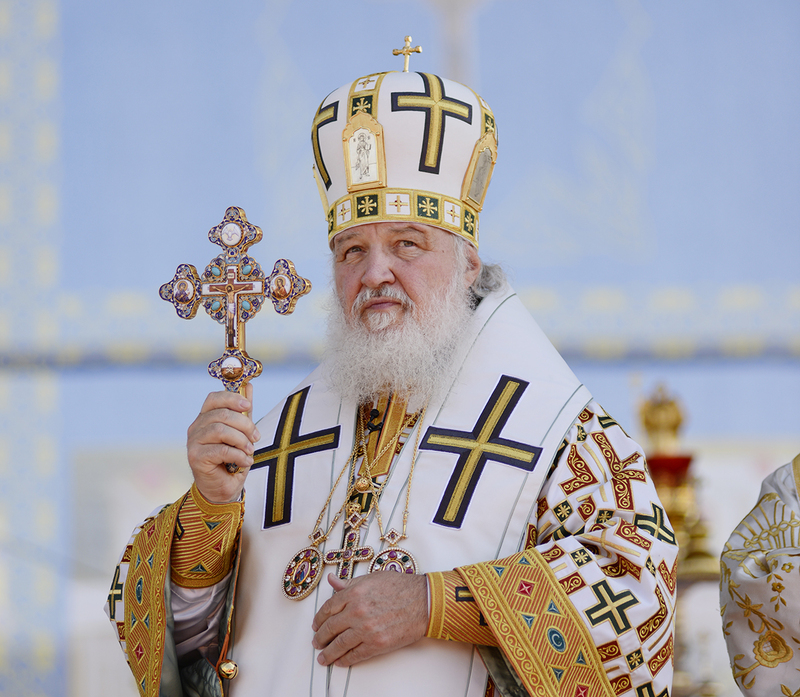 Once again, turning our noetic and prayerful gaze to the Holy Equal-to-the-Apostles Prince Vladimir, let us pray to him that newer and newer generations of people attach themselves to the spiritual choice that he made boldly and courageously, while still a pagan, but envisioning the greatness and beauty of the Christian way of life. Amen. I congratulate you all on the feast day! Spoken on July 27, 2012, at the monument to St. Vladimir in Kiev.